Chairman Johnson, Chairman Boustany, Ranking Members Becerra and Lewis, and Members of the Subcommittees, thank you for inviting me to discuss the Social Security Administration’s (SSA) efforts to ensure the accuracy of our benefit payments. I am SSA’s Deputy Commissioner, as well as the Agency Accountable Official for improper payments. Today I will describe our efforts to improve payment accuracy by preventing, detecting, and resolving improper payments. Social Security touches the lives of every American, often during difficult times of personal hardship, transition, and uncertainty. We oversee about 85,000 Federal and State employees who serve the public through a network of 1,500 offices across the country. Each day almost 180,000 people visit our field offices and more than 435,000 people call us for a variety of services such as filing claims, asking questions, and changing direct deposit information. During Fiscal Year 2010, we paid 58 million people over $740 billion in benefits. Specifically, we paid $572.5 billion in Old-Age and Survivor Insurance benefits, $122.9 billion in Disability Insurance benefits, and $47.2 billion in Supplemental Security Income (SSI) benefits. Our hard-working, dedicated employees have done their utmost to maintain the level of service that the American people expect and deserve. We have been innovative and proactive in adopting strategies to allow us to meet the challenges we face. Our information technology resources have been critical to our success. Inevitably though, as our workloads rose and our appropriated funds were less than our budget requests, our service delivery suffered. Despite a long string of increases in productivity, we could not keep up. Throughout most of the past decade, the amount of program integrity work we could handle dropped dramatically, even though we know that work saves the taxpayer about ten dollars for each dollar spent. The time a claimant waited for a disability hearing rose to an average of 800-900 days in many cities, and some claimants waited as long as 1,400 days. Waiting times for in-person and telephone service increased, as did the public’s and Congress’ frustration with us. 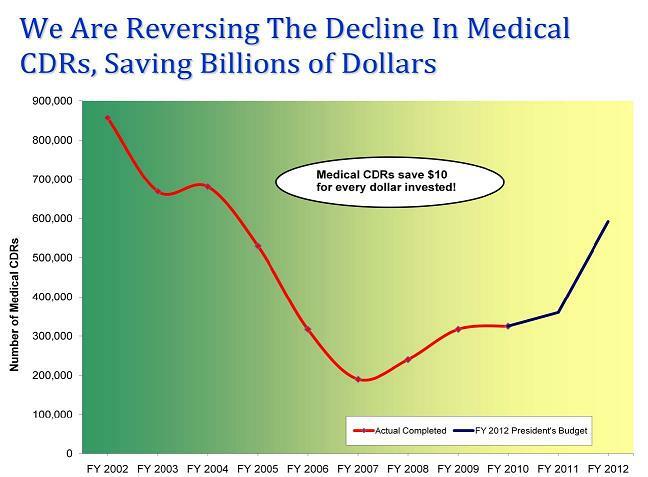 In the last three years, new initiatives coupled with improved funding have enabled us to reverse many of these trends and significantly improve service and stewardship efforts, even though we have had to absorb huge unexpected increases in workloads due to the recession. For example, in FY 2010 we reduced the time it takes to get a hearing decision to the lowest point in five years. Currently, the average wait for a hearing decision is below one year for the first time since 2003. We kept pending initial disability claims significantly below our goal and achieved the lowest average speed of answer and busy rates on our 800 number since we began keeping the statistics nearly a decade ago. Despite the surge of disability claims, our State disability determination services (DDS) employees achieved the highest level of decisional accuracy in over a decade. We increased the accuracy of our SSI payments in FY 2009 and FY 2010. We continue to increase online claims, with nearly 40 percent of retirement claims and about 31 percent of disability claims currently filed online through our highly-regarded internet site. We have worked hard to strengthen our ability to curb improper payments, but we cannot continue to improve our processes without adequate resources that allow us to do the work for which we are responsible. We pay nearly 60 million Americans who deserve to receive their benefits timely and accurately, and we deliver on that responsibility in nearly all cases. Our new employees learn, as soon as they are hired, that we strive to pay the right person the right amount at the right time. One of our four strategic goals is to preserve the public’s trust in our programs, which we maintain by ensuring that we spend tax dollars only as specified in the Social Security Act. We are committed to minimizing improper payments and protecting program dollars from waste, fraud, and abuse. In keeping with President Obama’s vision, we are also open and transparent about our improper payment situation and our efforts to improve that situation. We have an extensive website dedicated to information about SSA’s payment accuracy available to all at http://www.socialsecurity.gov/improperpayments/index.html. In FY 2010, 99.6 percent of all Old Age, Survivors, and Disability Insurance (OASDI) payments were free of an overpayment, and 99.8 percent were free of an underpayment. For FY 2010, each tenth of a percentage point in payment accuracy represents about $706 million in program outlays for the OASDI program. Therefore, while we are justifiably proud of our consistently high accuracy rate for OASDI payments, we recognize our responsibility to maintain and improve our performance. The Supplemental Security Income program is more complex. Benefits can change each month due to income and resource fluctuations and changes in living arrangements. For FY 2010, each tenth of a percentage point in payment accuracy represents about $50 million in SSI program outlays. 91.6 percent, and I am pleased to report that we have raised our accuracy or the second year in a row. Our FY 2010 overpayment accuracy rate was 93.3 percent. We were able to achieve this increase in part by increasing the number of redeterminations we completed in the last few years with increased resources to address program integrity workloads. In addition, our successful expansion of two key initiatives – Access to Financial Institutions (AFI), and our Supplemental Security Income Telephone Wage Reporting System (SSITWR) contributed to the increase. I will describe these in detail later in my testimony. This improvement is encouraging news and demonstrates the value of additional funding for program integrity efforts. Our primary program integrity activities are Continuing Disability Reviews (CDRs) and SSI redeterminations, reviews of factors in individual cases that could affect eligibility for benefits or the payment amount. These activities protect taxpayers’ investment in our programs. SSI redeterminations are periodic reviews of nonmedical factors of SSI eligibility, such as income and resources. 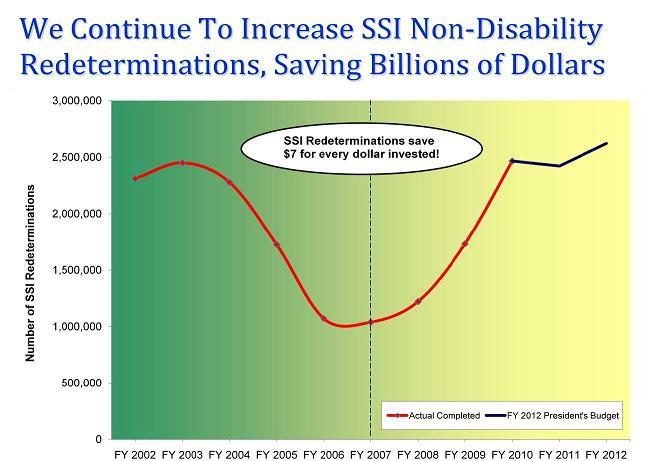 We estimate that every dollar spent on SSI redeterminations returns more than $7 in program savings over 10 years, including savings accruing to Medicaid. For many years, due to inadequate funding, we had to cut back on the number of redeterminations that we could complete. However, over the past few years, we increased the number of program integrity reviews we completed, saving billions of program dollars. With full funding of the FY 2012 President’s Budget for SSA, we would be able to complete 200,000 more redeterminations compared to this year, saving even more taxpayer dollars. Obviously, if we receive less funding, we would not be able to complete as much of this extremely cost-effective work. CDRs are periodic reevaluations to determine if beneficiaries continue to meet our medical criteria to receive benefits. The Social Security Act requires us to conduct medical CDRs on a periodic basis to evaluate whether disabled beneficiaries and recipients continue to meet the medical criteria. We also conduct medical CDRs when we receive a report of medical improvement from a disability beneficiary or recipient or third party. We estimate that every dollar spent on CDRs yields at least $10 in lifetime program savings, including savings accruing to Medicare and Medicaid. With full funding of the FY 2012 President’s Budget, we would be able to complete over 260,000 more medical CDRs compared to this year, resulting in considerable savings to the trust funds and general funds. Medical CDRs are completed two ways. The medical CDR process uses a statistical modeling system that uses data from our records to determine the likelihood that a disabled beneficiary or recipient has improved medically. If the statistical modeling system indicates that the beneficiary or recipient has a high likelihood of medical improvement, we send the case to the state DDS for a full medical review. We send the remaining beneficiaries and recipients a questionnaire requesting updates on their impairments, medical treatment, and work activities. If the completed mailer indicates that there has been potential medical improvement, we send the case to the DDS for a full medical review. Otherwise, we decide based on the mailer response not to initiate a full medical CDR, and we schedule the case for a future review. We have shown that with adequate funding, we are able to effectively produce results. For example, in 1996, we received a seven-year commitment of special funds to conduct CDRs. By the time the funding commitment expired at the end of FY 2002, we had initiated medical CDRs for all the 3 to 4 million cases in which they were due. From FY 2003 through FY 2007, inadequate funding meant we had to reduce the volume of CDRs we completed, and as a result, we could not process all the CDRs that were due. As the chart above shows, increased funding has allowed us to increase the volume of this type of work. We believe that a similar commitment of additional funds for our program integrity work will help us ensure that we can complete more of this cost-effective work each year and eliminate the current backlog of nearly 1.4 million CDRs. However, I must note that even with specific funding for program integrity work, we need the people to do that work in addition to all of their other core responsibilities. That is, the same employees who conduct redeterminations, continuing eligibility reviews, and collect overpayments, also have many other critical responsibilities, such as taking and adjudicating SSI, retirement, and disability applications. While workloads are growing and expanding, the number of people to do the work is decreasing. We rely on data exchanges to help us protect the integrity of our programs. Efficient, accurate, and timely exchanges of data promote good stewardship for all parties involved. We have over 1,500 exchanges with a wide range of Federal, State, and local entities that provide us with information we need to stop benefits completely or to change the amount of benefits we pay. We also have about 2,300 exchanges with prisons that allow us to suspend benefits to prisoners quickly and efficiently as required by the Social Security Act. Data exchanges are also a cost-effective way to prevent and detect improper payments. For example, in FY 2008, for every dollar spent on our pension match with the Department of Veterans Affairs, we saved nearly $39 in SSI benefits. Similarly, during the same timeframe, every dollar we spent on our match with Office of Personnel Management saved us almost $20 in OASDI benefits. We also depend on advanced technology to help balance the need to keep up with growing workloads and to be effective stewards of Trust Fund and tax dollars. Technology and automation are keys to providing quality service to the public as our workloads continue to grow. For example, we introduced systems enhancements that help streamline how we process medical CDRs. Performance of Substantial Gainful Activity (SGA) while receiving disability benefits is the major cause of inaccurate OASDI payments for FYs 2006-2010. Other major causes of OASDI overpayments for the same period are the Windfall Elimination Provision (WEP), Government Pension Offset (GPO), and receipt of Workers’ Compensation (WC). Although performance of SGA only affects disability benefits, errors attributed to SGA accounted for more than a quarter of all OASDI overpayment error dollars in FY 2010. While the number of SGA error cases is low, the dollars involved are often significant. Determining whether a beneficiary’s work and earnings are SGA takes considerable time and is challenging because of potential delays in getting the information we need to make this determination. We must get information about the beneficiary’s return to work from the beneficiary or the employers and must review and manually process large volumes of work reports. These delays contribute to the size of the overpayments. Because beneficiaries do not always tell us about their work activity, we rely on our match with IRS records to identify unreported work and earnings. This match generates about 600,000 alerts annually. We target the alerts with the highest identified earnings and work those cases first. We have allocated additional staff resources to analyze the work reports we get from any source and to conduct work CDRs (reviews that determine whether a beneficiary’s work affects their eligibility for disability benefits) and are targeting the cases with the oldest work reports – those over 365 days old. The President’s FY 2012 Budget includes a proposal that has the potential to reduce SGA-related overpayments. The Work Incentives Simplification Pilot (WISP) would allow us to test program innovations to provide beneficiaries with a simple set of work rules that should reduce improper payments. WISP would make work incentives easier to explain and understand, eliminating much of the confusion that contributes to SGA-related improper payments. With respect to the WEP and GPO provisions, overpayments result when beneficiaries fail to report receipt of a pension from non-covered employment. We generally have to reduce a beneficiary’s Social Security benefits if he or she also gets a pension. The President’s FY 2012 Budget includes a legislative proposal that would require State and local governments to identify and report pensions they pay to retired employees based on work not covered by Social Security. If we got this data from State and local governments, we could determine, in a timely manner, whether to reduce benefits because of the WEP or GPO. Another major cause of inaccurate payments is a beneficiary’s receipt of workers’ compensation payments. If a person receives both WC and Social Security disability benefits, the Social Security Act limits the total payment amount he or she can receive. Improper payments often occur when the amount of WC increases or decreases, but we do not timely receive the information we need to adjust the disability benefit. In most of these cases, the adjustment results in an underpayment. The President’s FY 2012 Budget includes a legislative proposal that would require State and local governments and private insurers that administer WC and public disability benefit (PDB) plans to provide us with information on WC and PDB payments. By requiring plan administrators to provide payment information to us promptly, this proposal would improve the integrity of the WC and PDB reporting process, improve the accuracy of Social Security disability benefit and SSI payments, and lessen our reliance on the beneficiary to report this information in a timely manner. SSI is complex because eligibility and monthly payment amounts are affected by changes in income, resources, and living arrangements. Improper payments often occur if recipients fail to timely report changes, such as an increase in the value of resources or an increase or decrease in wages. Failure to report these changes is the primary cause of improper payments and has been a perennial problem since the inception of the SSI program. The major causes of inaccurate payments in the SSI program are financial accounts and wages. Payment errors due to financial accounts always result in overpayments. These overpayments occur when a person has financial accounts that exceed the allowable resource limit, causing the person to be ineligible for SSI. One of our most useful tools to detect improper payments caused by financial accounts is our Access to Financial Institutions (AFI) process. AFI is an electronic process that allows us to identify financial accounts of SSI applicants and recipients that exceed statutory limits. This process has proven very useful in identifying undisclosed accounts. Thirty-six States currently use AFI; these States represent 90 percent of all SSI recipients. We intend to implement AFI in all remaining States by the end of this month. Beginning in FY 2013, when we expect full implementation of AFI, we project roughly $900 million in lifetime program savings for each year we use the process. 84 percent of wage-related improper payments occurred because the recipient or representative payee failed to report changes in earnings. In the past, SSI recipients had to either fax, mail, or bring their monthly wage reports to our field offices. In turn, our field office employees manually entered the reports into our system to make any payment changes. In some cases, we did not evaluate beneficiary wage information in time to adjust the applicable SSI payment. We now have a dedicated agency telephone number that allows recipients or their payees to report wages by calling in and using either voice-recognition or touch-tone software. Our SSI Telephone Wage Reporting (SSITWR) system automatically enters the wage data into the SSI system, which eliminates the need to enter a manual report. In FY 2010, we processed nearly 250,000 monthly wage reports using this system. These reports generally are accurate and require no additional evidence, which saves time in our field offices. SSITWR has allowed us to increase the volume of wage reports we receive, and therefore reduces wage related errors. Our goal was to increase the number of monthly reporters using SSITWR to 28,000 by September 2011. I am very pleased to report that we have already met this goal – as of April 30 we had 28,498 monthly reporters using the system, and that number continues to increase. In addition to our efforts to prevent and detect improper payments, we also have a comprehensive debt collection program. We recovered $3.14 billion in program debt in FY 2010 and $13.86 billion over the previous five-year period (FYs 2006-2010) at an administrative cost of $.07 for every dollar collected. We recover OASDI and SSI overpayments from overpaid beneficiaries and representative payees who are liable for the overpayment. To recover debt, we withhold current benefit payments from the debtor. It is harder to recoup a debt once benefits end; therefore, we make every effort to identify and collect debt as soon as possible. If the overpaid person no longer receives benefits, we offer the opportunity to repay debt via monthly installment payments. We plan to improve our debt collection programs by implementing several enhancements to allow us to take advantage of changes in the law that expand the availability of administrative offset. For example, we will make systems changes to allow us to collect delinquent debt via the Treasury Offset Program beyond the current 10-year statute of limitations. As resources permit, we will start using other existing debt collection authority such as private collection agencies, charging administrative fees and interest, and indexing a debt to reflect its current value. Before I close, I want to mention our hardworking, dedicated employees who are the real key to maintaining the American public’s trust in our programs. Our employees deserve full credit for our remarkable achievements. They continue to provide exemplary service and increase their productivity despite record-setting increases in our workloads. The programs we administer demand stewardship that is worthy of their promise of economic security. We are firmly committed to sound management practices, including accurate metrics for evaluating our programs’ integrity, and following up with appropriate enforcement and recovery actions. We know the continued success of our programs is inextricably linked to the public’s trust in them. Properly managing our resources and program dollars is critical to that success. Equally important to our success is having adequate and sustained funding to carry out all of our work.